When you put Iran and America in the same sentence, one expects to read about diplomatic fights, extremists, or the threat of nuclear annihilation. When you add China to the sentence the word “big” comes to mind: the world’s biggest population, biggest army, and biggest trading partner, with growing power that the world’s people don’t know whether to embrace or fear. Well, put those images aside, and prepare for a tale of cooperation, kindness and thankfulness; a tale that took place in Beijing, involving strangers who put aside national labels to build an unusual bridge between the East, West and Arab poles of our divided world. When I woke up on Monday, May 3, 2010, little did I expect to become the temporary translator for four Iranian men, seeking assistance in China, but that's what happened. Similarly, people from every part of the world rub shoulders every day in airplanes, business towers and scenic spots around the world, and perhaps little adventures like ours might be part of the process of helping so-called enemies set aside baseless fears to make the world a better place for all of us to live. By the time the clerk took my key I had ascertained that these men wanted to go somewhere, English wasn't their native language, and they didn't speak any Chinese. The hotel clerk was trying to speak English, but between her inability to understand their accent and everyone's lack of competence in this second language, they weren’t getting very far. Everyone seemed relived when I offered to help. “Where do you want to go?” I inquired. “The Great Wall,” a relieved stranger replied. “Oh,” I said (and not very enthusiastically), with a thousand potential problems racing through my mind. Now, the Great Wall is certainly worth seeing, but this happened to be a Chinese National Holiday weekend--International Labor Day. From personal experience, I knew that these guys were not going to like the options available to them. 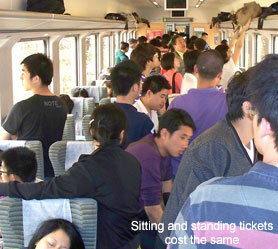 First, I told the men that we’d just been to the Great Wall the day before, by train, and found it extremely crowded. Then I said that their first decision had to be “how” to get to the Wall. There are basically four options from central Beijing—train, public bus, tour bus, and taxi—and each came with unique challenges. For the next few minutes I tried to present the options in English, stopping occasionally to ask the hotel clerk a question in Chinese. “How about going by train?” asked the man who spoke the best English—I’ll call him Hassan, though we never really learned anyone’s name. “How about going by public or tour bus?” Hassan asked. Then I asked, “How about a taxi?” This didn’t get a positive response. Taxis are no faster than buses, and you are paying for the driver’s time, so it could become very expensive. The men said that they didn’t have a fortune at their disposal (remember that, like me, they were staying at a budget hotel), so that option was not very promising. Next I turned my attention to the hotel staff, and asked (in Chinese) if they could help these guests arrange tickets on a tour bus—it would be a little more expensive than the train or public bus, and it would be a slow trip, but at least they would not get lost or have to face ticket queues in Beijing or at the Wall. I thought that any hotel in Beijing would surely know someone who could help visitors go to China’s most famous landmark. Surprisingly, they said they couldn't! However, the friendly clerk said, "a tour bus leaves from just down the street; you'll see a big sign, in English and Chinese." While all of this was happening, my wife was having a conversation with another one of these men—I’ll call him Ali. His English wasn’t as good as Hassan’s, but he said they were from Iran, and Vivian said that we were Americans. Vivian made a quick comment about “not all Americans”, but before they could get into a discussion our morning took an unexpected turn. Vivian would wait at the hotel for our ride to the airport (who had called to say he was stuck in Beijing traffic, and would be late), and I volunteered to take the guys down the street in search of a tour operator. As I walked briskly down the street, with Hassan at my side and Ali a step behind, Ali said, "You must have lived in China for four years to have such good Chinese!" I didn’t know about Vivian’s conversation and assumed that my accent had given it away. Americans may come in many colors and wear many clothing styles, but English-learners can quickly tell the difference between someone from the US, the UK, Australia, or Europe. Next, I asked where they were from, and found out that they were from Iran. The conversation didn’t skip a beat, nor did we slow down as I charged down the sidewalk with four new friends close behind. I knew that my wife was already anxious about our late departure for the airport, but I was determined to help if I could, and the rare chance to help someone from their nationality made me even more determined. As we walked, they told me that they were businessmen, and had been in various Chinese cities over the past 20 days. I said I taught English at a medical university in southwest China, and had come to Beijing for a former student’s wedding. Today (at any moment, actually) I would head to the airport to return to Kunming. They too were nearing the end of their trip, and really hoped to see the Great Wall before going back to Iran. Down the block, there were no signs for a tour company or tour bus, so I stepped into a convenience store to make inquiries. The clerk said she didn’t know anything about a bus, but there was a travel agent at the other end of the building, so off we went. Unfortunately, I didn’t have time to translate everything I was saying back into English, which must have been unsettling for the Iranians, but Hassan radiated a confident, understanding attitude, and stayed with me as we headed for the other entrance. “How about tomorrow?” I translated. After an awkward moment of silence, the travel agent suggested that they take a public bus. I'd seen the 191 terminus at Badaling (the nearest and thus most popular section of the Great Wall), and asked the agent where they could board on the Beijing end. 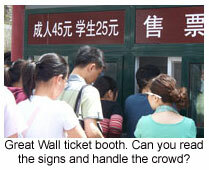 I wasn’t convinced, so I asked the agent how much it would cost to go to the Badaling section of the Wall by taxi. Again, she politely made a phone call, and reported back that it would cost about 230-250 yuan, depending on the traffic. Divided four ways, this sounded reasonable to the men, so Hassan, through me, asked if she could call a reputable taxi. Though my friend’s car was now behind the taxi, I argued for a moment, translating salient parts back to the Iranians. This suggestion was translated into a language I couldn’t understand for the other three, and was greeted with great approval. They piled into the taxi, thanking me profusely for the blur of activity that had just transpired, and adventurously sped off to make their last day in China a memorable one. At the same moment I jumped into another car, and my only regret was that I couldn’t have done more. It would have been fun to spend the day with them, or to hear about their adventure over a cup of Chinese tea that evening. But alas, my flight was waiting. The oddity of this Iran-America-China connection didn't really hit me until we drove off in opposite directions. Up to that moment, I'd been too busy to really care about who they were or where they were from or what kind of relationship I was supposed to be having with them. People from three extremely diverse cultures had interacted, and I was the unlikely link. It occurred to me that too often we interact with strangers on the basis of prejudice instead of on any realistic appraisal. I also thought about how much easier it would be for people to get along if they just tried to work on a current objective instead of acting in reaction to decades or centuries of hostility. In most circumstances, these people would have never sought each other, but thrust together we got along just fine. I’ve traveled to about twenty countries on five continents, and I’m convinced that it is not the people of the world who put up the walls that divide us. Most people are friendly, or are at least cordial, even to strangers. Sure, there are exceptions, as we saw on September 11 and frequently read about in the news, but the reason we hear about them is that they are exceptions. The constant sensational coverage of these exceptions, mixed with our innate nationalism, create or deepen our international mistrust and fear. Whatever our motives, Hassan, Ali, myself and the Chinese clerks had interacted around a common goal. It all happened so fast that it was almost like an automatic series of events, but surely I would have done just as much for any human being in similar circumstances. If you are thinking, “I wouldn’t have,” then I challenge you to examine your core values—do they promote division in the human family or harmony? On Tuesday, back in Kunming, my students reacted with amazement to this story, which is understandable considering that America and Iran are not exactly friends. Yet here I was, an American, acting as interpreter and tour consultant to a car load of Iranians. I told my students that, as a Christian, I didn't believe meetings like this occur by accident. "I believe God planned for me to walk out at just that moment,” I said, “so that I could meet and help these men." Why? That is harder to answer. Maybe it was simply so that this little group of Iranians, Chinese people and Americans could see each other in a different light. Hopefully, when these men think of "America" they will remember the Chinese-speaking guy who went out of his way to help them. Similarly, when I think of Iran, maybe I will not initially remember the Iran Hostage Crisis (that clouded 444 days when I was in college) or wonder if someday they will use nuclear power against their neighbors or against my countrymen; instead, I'll remember a friendly guy who treated me with respect, who had taken the time to learn my language, and who allowed me to act like a neighbor, one day on the streets of Beijing. And maybe, the hotel clerk, travel agent and taxi driver will also look differently at people from both the US and Iran. "If these guys could treat each other like friends,” I hope they will say, “then maybe there is more hope for peace than we’ve been led to believe, between middle-eastern people and western people." In other words, our neighbors aren't necessarily the people who live around us or who think like us, but the people who need us in the course of our daily lives. That Samaritan didn't wake up planning to help out someone from a people group who was prejudiced against his own people, but he had the compassion to look beyond his prejudices to help someone in need. © 2010 Michael Krigline. As far as I am concerned, people are allowed to print or copy this article, or link to it, for personal or classroom use.